A native of the San Francisco Bay Area, DJ Terrence moved to San Diego in the late 90’s and entered the electronic music scene in 2001. Originally the co-creator of TnS Productions with DJ Skeemz and a former member of SoCal’s 2-Hype Productions (Zen Festival, Supersonic, E-clipse, etc), Terrence has since released six independent full-length CDs. His style is centered on long precise mixing of banging electronic dance music tracks with chest-pounding bass. 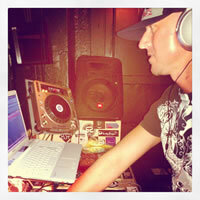 Over the years he has spun house, trance, and breakbeats. As a vinyl DJ purist, you will hear no auto-BPM mixing when Terrence is on stage. In addition to his DJ talents, Terrence is also an accomplished producer, studio engineer, and vocalist. Thus he leverages technical understanding of music theory and production as a foundation for creative mixing and delivering live performances that engage crowds and energize dance floors. In 2013 Terrence joined the San Francisco DJ Group, and in 2014 he joined the Muopia DJ Crew.